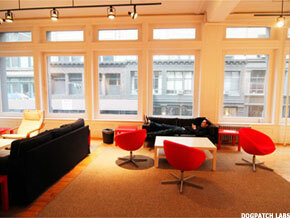 Dogpatch Labs is home to more than 15 start-ups looking to become tech's next big thing. NEW YORK ( TheStreet) -- Silicon Valley, which reared Apple ( AAPL - Get Report), Google ( GOOG - Get Report) and countless important, cutting-edge start-ups, still dwarfs New York City when it comes to fostering technology innovation. But the Big Apple's start-up scene is blossoming. While Silicon Valley captured 39% of all venture funding last year, investment in the New York area increased to 9% in 2010 from 6% in 2007, according to PricewaterhouseCoopers and the National Venture Capital Association. Taking advantage of the boom are more than a dozen Manhattan incubators, accelerators and so-called co-working spaces, which have emerged to foster entrepreneurs and their next great idea. Meet Dogpatch Labs, a 3,000 square-foot loft space in Manhattan's Union Square district that hosts 45 workers from 15 start-ups. Founded by Boston venture firm Polaris Ventures, Dogpatch -- named after the San Francisco neighborhood where the original Lab was located -- hit New York City two years ago. Dogpatch provides companies with free office space for six months (after the allotted time, they're replaced with another firm), and hosts workshops, conferences and networking events that connect entrepreneurs. Well-known Dogpatch graduates include iPhone photo sharing service Instagram, which recently passed its 1 million user milestone, and Q&A website Formspring, which has raised $14 million in funding. Matt Meeker, co-founder of network facilitator Meetup.com and an entrepreneur-in-residence at Polaris who helps advise start-up founders at Dogpatch, said the lab's focus on collaboration is tremendously helpful when trying to help a fledgling company off the ground. "There's no one person who is excellent at everything so it's good to lean on other people who can help you and are experts in ways that you aren't," he said. "We try to round out the skill set and have a diverse group of people here who can help each other in unique ways." Start-ups that want to work at Dogpatch must apply on its Web site, and are selected in a competitive process that includes the evaluation of a team's vision and background. Read on for some of the emerging companies that currently call Dogpatch Labs home. Online privacy continues to be a big concern for users of social networking sites like Facebook, which features more than 500 million users around the world and a set of highly-contested privacy settings that continually change. Seven out of 10 Facebook members say they are worried about privacy and viruses when using these sites, according to a recent poll by USA Today and Gallup. Enter Fridge, a site that allows users to create private social networks. The company, funded by start-up incubator Y Combinator, lets members organize private online sites where they can post status updates, share photos and organize events in an invitation-only setting. Fridge avoids some of the privacy problems that Facebook faces by letting users "cut through the noise and help people share exactly what they want with whom they want," Chang said. Going forward, Fridge -- which currently has around 27,000 registered users -- is looking at developing a mobile app. Online dress shirt maker Proper Cloth aims to solve a problem that many men face: finding well-fitting shirts that are both fashionable and affordable. After visiting Bangalore and Shanghai in the summer of 2007 and witnessing custom-designed clothing for the first time, former engineer Seph Skerritt decided to start Proper Cloth, which lets men customize shirts to their exact specifications over the Internet. "I always had trouble finding shirts, so this was a revelation for me," Skerritt said. "I think there is a huge opportunity for a simple, reliable, Zappos-like online custom shirt brand." Users choose the fabric (the site boasts more than 150 different types), buttons, cuff and collar style and can also decide if they want a pocket or a monogram. Users denote their collar size, sleeve length and type of fit; if they aren't sure of their measurements but know what size they wear in a Banana Republic or J.Crew shirt, they can select a size based on these brands. Once the shirt is designed, users can view it using a 3-D preview tool. Shirts start at $99 for basic fabrics and include free shipping; the average shirt price works out to be about $120, said Skerritt. Proper Cloth handles around 80 shirts per week; the company's revenues have doubled in the last year. Proper Cloth sources its fabric from Italy, Japan and China and production is done in Malaysia. Production typically takes two to three weeks. While the outdoor advertising industry is huge -- it's about a $6 billion business -- it remains one of the few areas of advertising where purchasing space like billboards and bus shelters is conducted offline, often via phone calls or e-mailed Excel spreadsheets. ADstruc wants to change that. Developed last year by John Laramie through the TechStars incubator program in Boulder, Colo., ADstruc makes the the outdoor advertising business more efficient by integrating relevant pricing, viewership and availability information about spaces online. Laramie came up with the idea for ADstruc when he was running a small marketing and advertising agency, and he realized that there was no easy way for clients to access information about launching outdoor campaigns. "There was no way to go to find billboards except to ride my bike around and see who was in the area," he said. Laramie said he is in conversations with major outdoor advertising companies -- the market is dominated by huge outfits like Lamar Advertising and Clear Channel Outdoor -- about using ADstruc's technology. The company generates revenue by taking a small fee on listed inventory, as well as a 15% transaction fee for sellers on every deal sold on the site. In September, ADstruc scored a $1.1 million investment led by venture capital firm DFJ Gotham. Fast Society is one of a dozen different start-ups in the much-hyped group texting space, where it competes with companies like GroupMe and Beluga. These apps makes it easier for multiple people to connect in real-time via text message, while also letting them share photos and location information in a private, chatroom-like setting. Fast Society hopes to carve out a niche in the space by targeting its product at 20-somethings and teens, giving them a way to keep in touch with each other at events like crowded music festivals and concerts. Fast Society has launched an edgy marketing campaign (its tagline: Built to Party!) that features a promo video with attractive 20-somethings using the app for a night out on the town. The company also solicited MTV and its racy show Skins as a corporate sponsor, and last week it sponsored a tequila-fueled house party during the South by Southwest festival in Austin, Texas. "We're not made for families or businesses," said Matthew Rosenberg, who with two co-founders launched Fast Society last year. "We're very specific and focused on socially active people." Fast Society's app is available for both the iPhone and Android platforms.